The NatTable 1.4.0 release was mainly made possible by CEA LIST in order to add new features to the Papyrus project. There were a lot of contributions in form of ideas, bug reports, discussions and even new features like formula support, fill drag handle, CSS styling and several more you can find in the following sections. We would like to thank CEA LIST for their commitment and support on developing the 1.4.0 release. Almost every change in code is tracked via ticket in Bugzilla, so if you are curious about the details and all the bugs that are fixed and enhancements that were added with the 1.4.0 release, have a look here. Deprecated GlazedListsDataProvider as the original intended performance boost can not be verified using a current Java version. It also introduces several issues in a multi-threaded environment, since GlazedListsDataProvider is not thread-safe. Contains CSS styling support and a general selection listener that works with the ESelectionService. To use this extension you need at least Eclipse Neon and Java 8. Contains integration support for the Nebula RichText control. To use this extension you need at least Eclipse Luna. The NatTable features now also include the third-party libraries they are making use of. This means for example that the GlazedLists Extension feature also contains the bundle ca.odell.glazedlists. This makes it easier to install and consume the NatTable features. Added support for copy & paste within NatTable. Internal clipboard that is used to temporarily store copied cells for later paste actions. There is one instance created and referenced per NatTable instance. ILayerCommandHandler that handles the CopyDataToClipboardCommand and additionally stores the copied cells in the InternalCellClipboard. Supports copy operations only for consecutive selections. Needs to be registered on a layer above the SelectionLayer, e.g. the NatTable itself. For formula support the FormulaCopyDataCommandHandler sub-class is provided. ILayerCommandHandler that handles the PasteDataCommand to paste the copied cells from the InternalCellClipboard. Needs to be registered on a layer above the SelectionLayer, e.g. the NatTable itself. For formula support the FormulaPasteDataCommandHandler sub-class is provided. ILayerListener that clears the InternalCellClipboard on structural changes. IKeyAction that can be registered to clear the InternalCellClipboard. The DefaultFormulaConfiguration registers it for the ESC key. IKeyAction that can be registered to paste data to the current selected position. The DefaultFormulaConfiguration registers it for CTRL+V. IKeyAction that can be registered to paste data to the current selected position if there is something in the InternalCellClipboard. Otherwise the selection anchor moves one position down. The DefaultFormulaConfiguration registers it for ENTER. Specialized SelectionLayerPainter that is used to render a border around cells that are currently stored in the InternalCellClipboard. Needs to be set to the SelectionLayer via SelectionLayer#setLayerPainter(ILayerPainter). Added formula support similar to the capabilities of well known spreadsheet applications. The parser that is used to evaluate formulas and therefore the basic part of the formula support in NatTable. It supports the evaluation of basic mathematical operations and functions, and is able to evaluate cell references. Wrapper around a base IDataProvider that makes use of the FormulaParser for formula evaluation in case a formula/function is the cell value. The sub-class FormulaRowDataProvider that implements the IRowDataProvider interface to support row based compositions. IDisplayConverter that needs to be registered for DisplayMode#EDIT in order to support editing of formulas while in normal mode the formula result will be shown. A FormulaErrorReporter can be registered with the FormulaDataProvider to be able to report formula evaluation errors to the user. The default implementation FormulaTooltipErrorReporter reports the error to the user via tooltip. Special command handler implementations to handle copy&paste and fill drag operations that update formulas relatively to the paste location. Commands to disable/enable formula evaluation at runtime. This can also be done directly via FormulaDataProvider. Default configuration for formula integration to a NatTable. A formula always starts with an equal sign (=) and is followed by math operations, cell references, numbers and functions, e.g. =SUM(A0:A9)*0.5. It is possible to use cell references in formulas to perform calculations based on values in other cells or cell ranges. NatTable uses the same reference mechanism as in other well-known spreadsheet applications. AVERAGE Calculates the average of a list of supplied numbers. MOD Calculates the remainder from a division between two supplied numbers. NEGATE Negates the given value. POWER Calculates the result of a given number raised to a supplied power. PRODUCT Calculates the product of a supplied list of numbers. QUOTIENT Calculates the quotient of a division. SQRT Calculates the positive square root of a given number. SUM Calculates the sum of a supplied list of numbers. and register it to via FormulaParser#registerFunction(String, Class<? extends AbstractFunction>). Note: As the instantiation of a function is done at runtime via reflection, the function class needs to be a public class with an empty default constructor! For exporting formulas the PoiExcelExporter in the Apache POI Extension was extended. It is now possible to set a FormulaParser so formulas in NatTable are exported as Excel formulas. Added the feature to add a fill drag handle similar to well known spreadsheet applications. This can be enabled by simply adding the FillHandleConfiguration to a NatTable instance. Note: Ensure that the NatTable instance is editable in order to make the fill drag handle work. It is not intended to update cells that are not editable. Specialized SelectionLayerPainter that renders a selection handle on the bottom right of a consecutive selection. Listener that will trigger a markup of the cell to which the fill drag handle should be bound. MouseEventMatcher that returns true in case the mouse moves over the fill drag handle rendered by the FillHandleOverlayPainter. Action that will change the cursor to a small cross to indicate fill drag behavior can be used. IDragMode that gets activated once the fill drag handle is dragged. ILayerCommandHandler that handles the ILayerCommand which is triggered on releasing the fill drag handle. For formula support the FormulaFillHandlePasteCommandHandler sub-class is provided. The Papyrus team published a video to demonstrate the integration and adaption of the NatTable fill drag handle to Papyrus tables and trees. 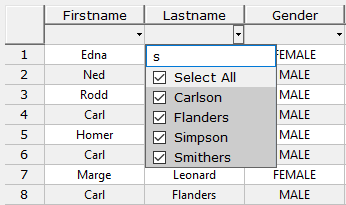 ILayerCommand that is used to delete the values in the current selected cells. ILayerCommandHandler that handles the DeleteSelectionCommand Sets the values of the current selected cells to null. Needs to be registered a layer above the SelectionLayer, e.g. the NatTable itself. IKeyAction that can be registered to trigger the DeleteSelectionCommand. The DefaultFormulaConfiguration registers it for the DEL key. Added support for content proposals via JFace IControlContentAdapter and IContentProposalProvider. The following snippet creates a TextCellEditor that provides content proposal on pressing CTRL + SPACE. The NatTable messages class org.eclipse.nebula.widgets.nattable.Messages now provides a static method changeLocale(Locale) to support locale changes at runtime. This makes it possible to also re-localize the NatTable internal labels, e.g. for NatTable menu items. NatTable currently only provides translations for English and German. Contributions of additional languages are welcome. Alternatively you can add or replace translation property files via fragments as documented widely. Added the ConfigAttribute CellConfigAttributes#GRID_LINE_WIDTH to support the configuration of the grid line width. This was mainly introduced because of print issues where grid lines where sometimes not rendered because of rounding issues related to 1px grid lines. The AutoResizeHelper was introduced to perform in-memory pre-rendering. It is used to perform auto-resizing with ICellPainter that are configured to calculate the row height or column width based on the content. The usage of the AutoResizeHelper is important for printing if such dynamic size calculation painters are used and is therefore executed by the LayerPrinter. The NatCombo and the combo box cell editors that are based on NatCombo now support filters similar to filterable viewers in JFace. Thanks to Ryan McHale who contributed that feature. The filter can either be enabled directly via NatCombo by setting the showDropdownFilter constructor parameter to true or by setting the corresponding flag on the editor via ComboBoxCellEditor#setShowDropdownFilter(boolean). Added the FilterRowRegularExpressionConverter that supports simplified wildcard support for regular expression filters. This IDisplayConverter will transform * to the regular expression (. *) and ? to the regular expression (.?). The new NatTable Nebula Extension contains support for integrating the Nebula RichText control. With this integration it is possible to render HTML formatted text in NatTable cells. ICellPainter implementation that makes use of the org.eclipse.nebula.widgets.richtext.RichTextPainter to render HTML formatted text. ICellEditor implementation that makes use of the org.eclipse.nebula.widgets.richtext.RichTextEditor to edit HTML formatted text via Nebula RichText control. The RichText editor control can be moved by dragging it from the upper left corner and resized by dragging the lower right corner. IDisplayConverter implementation that wraps another IDisplayConverter and is able to wrap a value with HTML tags. Note: The RichTextCellEditor is committed on pressing CTRL + ENTER. The new Eclipse 4 Extension contains a default implementation of a selection listener that provides a selection via ESelectionService. It is an ILayerListener implementation that needs to be registered on the SelectionLayer. By default it only reacts on full row selection and sends a List of row object values. Therefore an Eclipse 4 selection listener could look like this. This behavior can be changed to send only a single value or react on every cell selection. Check the API for further details. The new Eclipse 4 Extension contains support for CSS styling based on the Eclipse 4 CSS engine. The NatTable repository now contains an additional example project org.eclipse.nebula.widgets.nattable.examples.e4 based on Eclipse 4. There you can find several examples regarding different CSS styling capabilities, selection listener, popup menu configuration via application model. It will be further improved in the future and possibly published as downloadable application aswell. And then configure that class for a NatTable instance via setData(). If you want to use multiple NatTable instances in one application that should be styled differently, you should not use the general NatTable selector at all. The styles configured for the general selector will always win. Instead you need to use class or id selectors in the CSS style definition and the NatTable configuration. :normal DisplayMode#NORMAL. Doesn't need to be specified as this is the default. :select DisplayMode#SELECT used to specify the styling for selected cells. :edit DisplayMode#EDIT used to specify the styling of cells that are currently edited. :hover DisplayMode#HOVER used to specify the styling of cells that are hovered by the mouse. :select-hover DisplayMode#SELECT_HOVER used to specify the styling of selected cells that are hovered by the mouse. In NatTable conditional styling is achieved via configuration labels. These labels are added via IConfigLabelAccumulator to cells. For CSS styling these labels can be used in child selectors via id or class based selector. To inform the CSS engine about the available labels, the IConfigLabelProvider interface was introduced, which extends the IConfigLabelAccumulator interface. All NatTable default IConfigLabelAccumulator are changed to IConfigLabelProvider in order to support styling via child selectors. The labels used by a NatTable can be read via NatTable#getProvidedLabels() which asks the underlying layers via AbstractLayer#getProvidedLabels(). This means, if custom labels that are provided via custom IConfigLabelAccumulator should be usable in CSS styling via child selectors, the IConfigLabelAccumulator implementation needs to implement IConfigLabelProvider. NatTable Style definitions for DisplayMode#NORMAL. Applied to all NatTable instances. .basic Style definitions for DisplayMode#NORMAL. Applied to NatTable instances that have the CSS class basic. .basic:select Style definitions for DisplayMode#SELECT, which means they are applied to selected cells in NatTable instances that have the CSS class basic. .basic > .COLUMN_HEADER Style definitions for DisplayMode#NORMAL. Applied to cells with config label COLUMN_HEADER in NatTable instances that have the CSS class basic. .basic > .COLUMN_HEADER:select Style definitions for DisplayMode#SELECT and config label COLUMN_HEADER. Applied to column header cells of columns that contain selected cells in NatTable instances that have the CSS class basic. NatTable supports a wide range of CSS properties for style configuration. Most of them can be used on the table and the child level (child selector for label based configurations). A few can only be used on the table level, because they wouldn't have an effect for single cells. border CSS property for CellStyleAttributes.BORDER_STYLE. Triggers the usage of the LineBorderDecorator. border-color CSS property for CellStyleAttributes.BORDER_STYLE. Triggers the usage of the LineBorderDecorator. border-style CSS property for CellStyleAttributes.BORDER_STYLE. Triggers the usage of the LineBorderDecorator. border-width CSS property for CellStyleAttributes.BORDER_STYLE. Triggers the usage of the LineBorderDecorator. cell-background-color CSS property for CellStyleAttributes#BACKGROUND_COLOR. Triggers the usage of the BackgroundPainter. cell-background-image CSS property for configuring a background based on an image. Triggers the usage of the BackgroundImagePainter. color CSS property for CellStyleAttributes#FOREGROUND_COLOR. conversion-error-background-color CSS property for specifying the background color of a text cell editor on conversion error. conversion-error-color CSS property for specifying the foreground color of a text cell editor on conversion error. conversion-error-font CSS property for specifying the font of a text cell editor on conversion error. conversion-error-font-family CSS property for specifying the font family of a text cell editor on conversion error. conversion-error-font-size CSS property for specifying the font size of a text cell editor on conversion error. conversion-error-font-style CSS property for specifying the font style of a text cell editor on conversion error. conversion-error-font-weight CSS property for specifying the font weight of a text cell editor on conversion error. font CSS property for specifying the font via CellStyleAttributes.FONT. font-family CSS property for specifying the font family via CellStyleAttributes.FONT. font-size CSS property for specifying the font size via CellStyleAttributes.FONT. font-style CSS property for specifying the font style via CellStyleAttributes.FONT. font-weight CSS property for specifying the font weight via CellStyleAttributes.FONT. grid-line-color CSS property for the color of the grid lines. grid-line-width CSS property for the width of the grid lines. image CSS property for CellStyleAttributes.IMAGE. Triggers the usage of the ImagePainter. invert-icons CSS property to configure whether default decorator icons should be inverted. padding CSS property to specify cell padding. Triggers usage of the PaddingDecorator if painter resolution is enabled. padding-bottom CSS property to specify the bottom padding of a cell. Triggers usage of the PaddingDecorator if painter resolution is enabled. padding-left CSS property to specify the left padding of a cell. Triggers usage of the PaddingDecorator if painter resolution is enabled. padding-right CSS property to specify the right padding of a cell. Triggers usage of the PaddingDecorator if painter resolution is enabled. padding-top CSS property to specify the top padding of a cell. Triggers usage of the PaddingDecorator if painter resolution is enabled. painter CSS property for configuring the painter. painter-resolution CSS property for enabling/disabling the automatic painter resolution based on CSS properties. password-echo-char CSS property for CellStyleAttributes.PASSWORD_ECHO_CHAR. Does not trigger the usage of the PasswordTextPainter. This needs to be done via additional IConfiguration or painter CSS property. percentage-decorator-colors CSS property for configuring the colors to use with the PercentageBarDecorator. render-grid-lines CSS property to specify whether grid lines should be rendered or not. text-align CSS property for CellStyleAttributes.HORIZONTAL_ALIGNMENT. Combinations are possible via space separated list. text-direction CSS property to specify whether text should be rendered horizontally or vertically. Default is horizontal. Triggers the usage of either TextPainter or VerticalTextPainter. text-trim CSS property to specify whether text should be trimmed on rendering words or not. text-wrap CSS property to specify whether text should be trimmed on rendering words or not. validation-error-background-color CSS property for specifying the background color of a text cell editor on validation error. validation-error-color CSS property for specifying the foreground color of a text cell editor on validation error. validation-error-font CSS property for specifying the font of a text cell editor on validation error. validation-error-font-family CSS property for specifying the font family of a text cell editor on validation error. validation-error-font-size CSS property for specifying the font size of a text cell editor on validation error. validation-error-font-style CSS property for specifying the font style of a text cell editor on validation error. validation-error-font-weight CSS property for specifying the font weight of a text cell editor on validation error. vertical-align CSS property for CellStyleAttributes.VERTICAL_ALIGNMENT. CSS property for the NatTable background color. This has effect on the area that does not show cells or cells with a transparent background. CSS property for the NatTable background image. This has effect on the area that does not show cells or cells with a transparent background. CSS property to specify the border of the fill drag handle. CSS property to specify the color of the fill drag handle. CSS property to specify the border style of the fill region. CSS property for the color of the freeze separator. CSS property to specify the border color that is applied around the NatTable. Triggers the usage of the NatTableBorderOverlayPainter to apply borders on every side of the table. Setting the value auto will use the configured grid line color as the table border color. CSS property for configuring the tree structure painter. Similar to painter but specific for the tree structure configuration as it registers a painter for TreeConfigAttributes.TREE_STRUCTURE_PAINTER. Note: The value should always end with tree to configure a valid tree structure painter. It is mainly intended to configure the painter hierarchy (background and decorators) and whether to use inverted default icons via invert-icons. Note: The content painter that should be wrapped by the tree structure painter does not need to be added here aswell because it is evaluated dynamically. The painter configuration is something special to NatTable. Styling in NatTable is a combination of styles and painters. By default the painters will be derived from the specified style, e.g. specifying an image will trigger the usage of the ImagePainter. There are several cases where this behavior is not intended. NatTable for example has its own inheritance model. If a painter is not found for a label and DisplayMode, first the configuration value is searched for the label and DisplayMode hierarchy, and afterwards without label but with a DisplayMode hierarchy. If painters are registered automatically for CSS style configurations, the NatTable internal inheritance does of course not work anymore, as no search is performed. although it mostly doesn't make sense to not configure a content painter. none Special value to explicitly set no content painter. Needed because by default the TextPainter will be used as fallback in case an invalid value is specified as content painter. The following example shows how to register a painter that renders a cell with gradient background and padding around a checkbox. It is also possible to use custom painters in NatTable CSS painter configurations. For this a CellPainterCreator or CellPainterWrapperCreator, that creates an instance of the custom painter, needs to be registered to the CellPainterFactory. By default the new in-memory pre-rendering is enabled to ensure that content painters that dynamically calculate the row height or content width based on the content of the cell trigger the resize before printing. This behavior can be disabled via LayerPrinter#disablePreRendering() and enabled via LayerPrinter#enablePreRendering(). On printing the grid line width will be increased to 2px in case no other explicit configuration is applied. This setting will be decreased again afterwards. The increase of the grid line width is necessary to correct printing issues where grid lines where sometimes not rendered because of rounding issues.